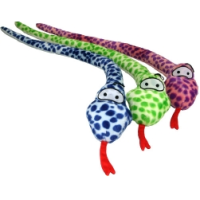 Manufacturer: James & Steel Ltd.
James and Steel Plush Snake with Squeaker Dog Toy is a wonderfully soft dog toy, ideal for those dogs who love a toy to snuggle up with. This long, slender toy is easy for dogs to pick up and toss around and boasts a hidden squeaker for added interactive fun and excitement. Please note: Colours may vary and cannot be guaranteed.